The Yangtze floodplain is of huge global importance for waterbirds. It is the most important region in Asia for wintering migratory waterbirds, supporting most of the worlds Siberian Crane, Swan Goose, Lesser White-fronted Goose and Oriental Stork, as well as other globally threatened waterbirds and significant proportions of many other waterbird species. Since 2009, WWT has supported the efforts of WWF China and the National Forestry and Grassland Administration to develop a comprehensive waterbird monitoring network in the Yangtze floodplain. This work began in 2004, when WWF China supported a census of most of the key sites within the region, which was largely undertaken by the late Mark Barter. This was repeated in 2005, and the combined results revolutionised the knowledge of waterbird abundance in the Yangtze, and within Asia generally. The census was repeated again in 2011 and most recently in January 2015, and the next is scheduled for January 2020. Reports from these surveys are available to download below. 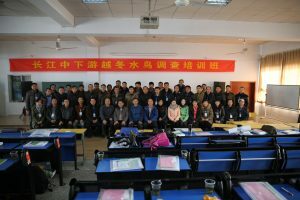 In the years since WWT became involved, we have worked with WWF to produce a strategic plan for the development of the Yangtze Waterbird Monitoring Network (YWMN), conducted a number of training workshops and other liaison events with reserve managers, local bird watching societies and university students. We have also recruited a YWMN project officer, Xudong Tao, to coordinate this work. Xudong has been able to provide vital liaison with reserve managers and help develop annual monitoring at many of these sites, and work towards greater partnership working and shared data. All of this is significantly improving our ability to track the conservation status of many Asian waterbird populations, a number of which are of high conservation concern.